New Fremantle head coach Trent Cooper was victorious in his first AFLW match. Fremantle finally locked away their first interstate win, as they caused a round 1 upset over Melbourne by four points on a hot and windy day at Casey. This was the second highest scoring AFLW match. It was a tight opening term from both sides where the AFLW heat policy was in place. Melbourne’s Aleisha Newman kicked the first goal of the match and this was followed by Melbourne’s second goal scored by Kate Hore. 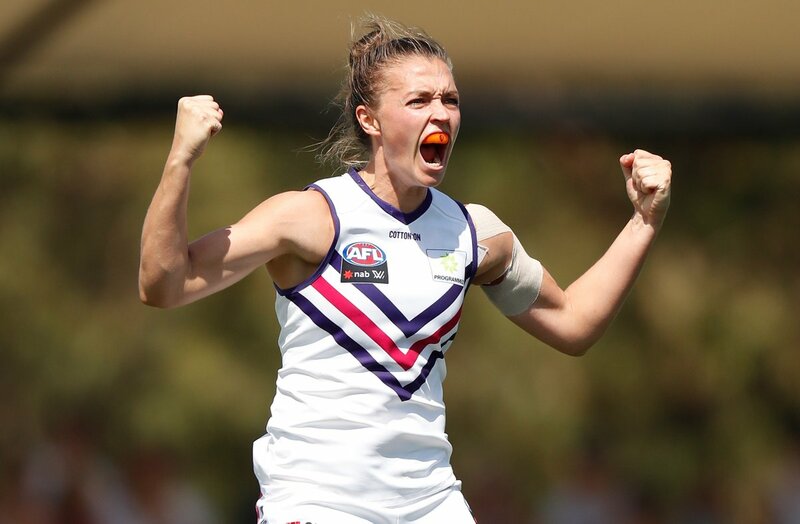 Fremantle debutant Sabreena Duffy put through her first goal with her first kick. Then soon after her teammate Steph Cain slotted through Fremantle’s second goal after she showed finesse in the forward line. Fremantle were red hot in the first quarter, as Ashley Sharp booted through the third straight goal on the siren. Melbourne’s backs were under immense pressure late in the first quarter as in the hot conditions Dockers hit back strongly and took a narrow lead of five points at quarter time. Fremantle were all over Melbourne in the second quarter as they outscored Melbourne three goals to one. Melbourne’s Eden Zanker kicked the first goal of the second quarter. Fremantle defender Ebony Antonio has turned forward this season. Antonio shows that she can do it in the forward line as well as she kicked truly for a great goal after she grabbed the ball and turned inside out. Fremantle looked strong in contested marks and a much stronger side than they were last season. They shifted all the momentum their way and were on top in the contest. Fremantle used the ball smartly and this gave Mel Caufield a shot from near the goal square and she slotted it through the big sticks as the siren sounded. Fremantle played an exceptional first half of football against a high quality side in Melbourne. At the main break Fremantle had a superior 20 points advantage over Melbourne. Melbourne came out a different team after half time and was dominant everywhere in the third quarter. Shelley Scott slotted through the fourth goal for Melbourne and a much needed goal. Both teams continued to tackle hard in the heat and neither team dropped off in intensity. Tegan Cunningham check side goal from the boundary and Melbourne shifted the momentum their way in the third term. Soon after Zanker kicked another Melbourne major with a banana kick from boundary. Melbourne’s Maddie Gay with fourth consecutive goal for her side. Bianca Jakobsson nailed through Melbourne’s fifth goal of the quarter. Melbourne went into demolition mode with five goals, eight inside 50s to Fremantle’s zero and 11 clearances to 4. It was a great comeback from Melbourne and this was because of players Lily Mithen, Karen Paxman, Cunningham, Zanker and Gay who lifted their game markedly. At three quarter time Melbourne were up by 14 points. In the final term the Dockers kicked with the breeze. Antonio continued to be a headache for the Melbourne defense with her great forward pressure, as she marked strongly and kicked to Kiara Bowers who marked and delivered with her first goal in the AFLW. Bowers placed an inspirational tackle in defense soon after and she was involved in everything in the final term. Fremantle turned the game on its head late in the fourth. Sharp kicked the easiest goal from the goal square after she snuck away behind the pack. Sharp was influential up forward for Fremantle with two goals. Fremantle’s Kellie Gibson arched her back and kicked the ball forward to Gemma Houghton who marked strongly for a fantastic contested mark. Houghton nailed the winning goal as Fremantle were victors by four points. This game would be the game of the round with the amount of momentum shifts throughout and neither team took a step back. What a game of AFLW football!